Half a Mind 2: Inductive reasoning or deductive reasoning? There are two ways that we come to have knowledge. One is by reasoning from repeated observations (inductive), the other is by ensuring the conclusion follows validly from the premises (deductive). The two are inextricably linked. Each makes an argument that helps advance our knowledge of the world. More surprisingly, each argument fails by the standards of the other! Inductive reasoning is about coming to a conclusion from specific instances (empirical data), deductive reasoning is about coming to a conclusion from premises (logical reasoning). An inductive argument might be illustrated by the following classic argument: "All swans I have ever seen are white, I have seen lots and lots of swans, therefore all swans are white." A deductive argument might be illustrated by the following argument: "All swans are white, this is a swan, therefore it must be white." First, we might note that the structure of the two arguments looks fairly similar - which can be confusing. Second, the conclusion of the inductive argument "all swans are white" is the first premise of the deductive argument. Aristotle observes, "Induction introduces us to first principles and universals, while deduction starts from universals..." (Nichomachean Ethics 1139). This highlights that each needs the other in order to develop knowledge. The inductive argument (the first one based on the observation of many swans) is a probabilistic argument. The problem is that the conclusion does not necessarily follow from the observations. Seeing lots of white swans does not necessarily imply that all swans are white. This is the problem of induction (as identified by Hume, but earlier by Pyrrohnic Sceptic, Sextus Empiricus). One swan of a different colour, and the conclusion is shown to be false. The problem of induction was arrestingly illustrated by the Dutch explorer Vlamingh's discovery of black swans in 1697 when he landed in Western Australia. The inductive problem underlies the way we underestimate the probability of unusual events such as catastrophic collapses of the financial markets as captured in Nassim Nicholas Taleb's black swan theory. This is why the philosopher C.D. Broad says that "induction is the glory of science and the scandal of philosophy"
So are we any better with deduction. The deductive argument was "All swans are white, this is a swan, therefore it must be white". The argument is valid, no rules of logic have been violated, and the conclusion follows from the premises. However, the problem is that the argument is meaningless ("unsound") if the premises are false. And the first premise is that "all swans are white", the failed conclusion of the inductive argument! The logic of induction fails (the problem of induction), and the soundness of deduction rests on the truth of the premises which at some point, generally rely on induction. Ultimately, we need both inductive and deductive reasoning, all while having to also accept that neither is capable - independently or even jointly - of providing certain knowledge. It's the best we can do. The only thing of which we can be sure is that uncertainty prevails. 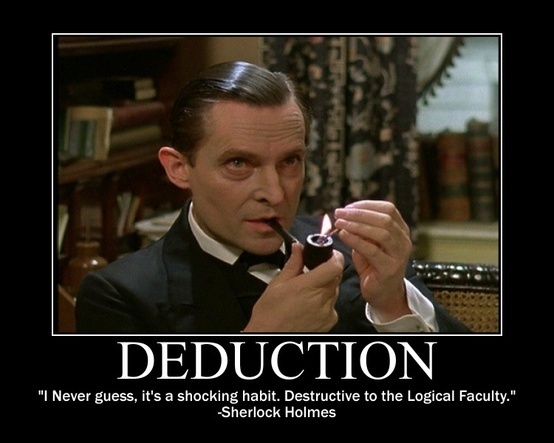 Does Sherlock Holmes use deduction or induction in making his arguments? Don't jump to conclusions! Take a look at the following examples before deciding. And from "The Adventure of the Cardboard Box"
"Let me run over the principal steps. We approached the case, you remember, with an absolutely blank mind, which is always an advantage. We had formed no theories. We were simply there to observe and to draw inferences from our observations." Or look here for more quotes. While we typically associate Sherlock Holmes with deduction, much of his reasoning as illustrated relies heavily on induction. His descriptions are paradigmatic descriptions of the process of making inferences (forming beliefs) from observation (see a similar view here).